Continuing our annual tradition, I've rounded up the very best of our writing and thinking from the past 12 months. So with a big thank you to our readers, new and old, here's the best of what we shared in 2013. Great discussion in the comments about how companies classify inside sales reps for compliance with the Department of Labor’s FLSA. Mr. SaaS Marketing himself stops by to share the key ingredient that most demos are missing. If you're hiring recent college grads, make sure you're screening for the new ABCs. Three sales leaders share how their companies have dropped 'traditional' territories in favor of new approaches. ADRs, BDRs, SDRs - whatever you call them, the metrics that drive the sales development function are always in demand. Includes comp, quota & activity metrics. We studied 197 B2B SaaS companies. 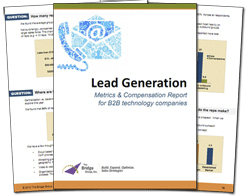 This report is focused on the inside sales (closing business) model exclusively within SaaS. Includes comp, quota, ramp, tenure & activity metrics. What separates the most effective Sales Reps on LinkedIn from the rest? We share what the best social prospectors do to separate from the pack. We've got some exciting projects in the works, so stay tuned. Here's to much success in 2014.